Our collection of Malibu Tables are the perfect focal point for conversation, drinks or a meal. Ours come in conversation, dining, bistro or bar height. When combined with our Malibu Chairs your outdoor activities will take place in a gracious setting that promises interesting discussions, fun and lots of laughter. 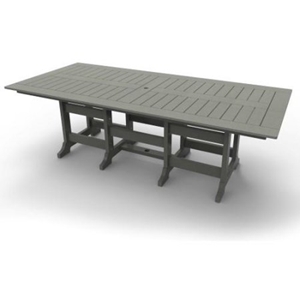 Our polyethylene furniture is manufactured from recycled dairy and detergent bottles, eliminating the need for harvesting precious wood and reducing pollution and waste in our nation's landfills. Weather resistent, it will not splinter, mildew, rot or suffer from insect damage. The gorgeous colors do not require staining, sealing or painting to keep them vibrant for the life of the piece. Relax and even put your feet up at one of our round Conversation Tables. They come in either 30" or 36" in diameter and, with two or more of our Malibu Chairs, provide the perfect center for your life outdoors. Our Malibu Dining Tables come in a variety of styles, sizes and colors. Some are more formal that others. Each of them will enhance the atmosphere on your patio or deck, next to your pool, or in your garden. 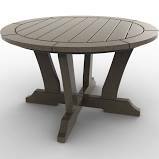 You can choose a 30", 36" and 48" round table or a 42" square table in many colors to suit the place you want it or accomodate the number of chairs you need. 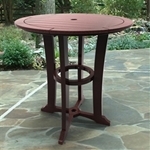 In between the height of our dining tables and our bar tables, are our round and square Counter Height Tables. 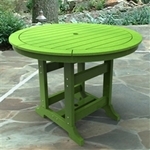 At 35" high, they raise you up a bit, but not too high for the perfect meal, drink or conversation outdoors!